Black collar WTF uniform "Expert"
45/55 especially, 8 oz honeycomb fabric. Cut long and loose-fitting jacket. 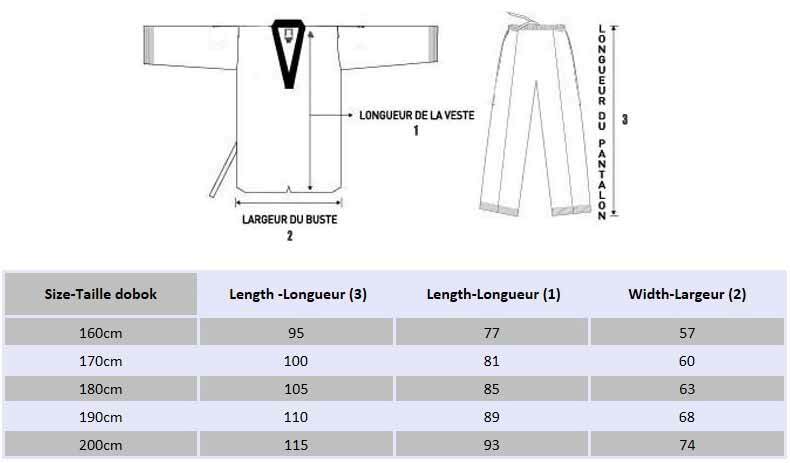 Pants long and loose, double sewing with elastic waist, narrowing down and stitched at the bottom of the sleeves and legs. This uniform is made from a blend of 55% cotton and 45% polyester fabric. It is designed with a honeycomb fabric, which allows to reduce the bacteria accumulation . Better ventilated, this fabric also allows to increase the longevity of your dobok. The seams are also strengthened at the level of the sleeves and the lower legs. 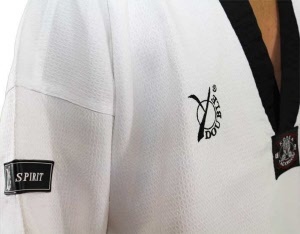 This uniform will withstand the daily use rigours and frequent washes. the structure of the synthetic fibre is changed digging grooves. Transpiration by the rails spread easily, the garment dry faster. The humidity is therefore disseminated outward. 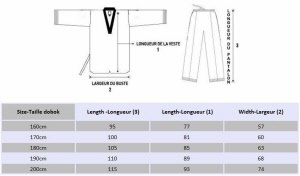 Dobok's fabric is most often a mixture of polyester and cotton, in varying proportions. A slight narrowing in the first washing is possible. It is more important for the pure cotton uniform. 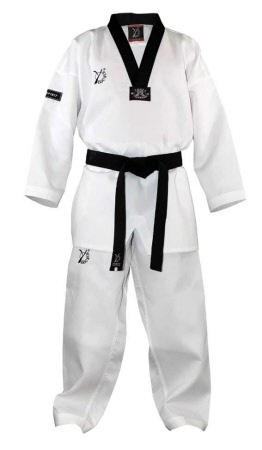 For this reason, it is better to wash the dobok before making a hem. Recommended washing temperature 30 °max. Avoid bleach water that is bleaching the black and poom collars and the embroidery. A good quality uniform put to dry correctly will not need to be ironed.